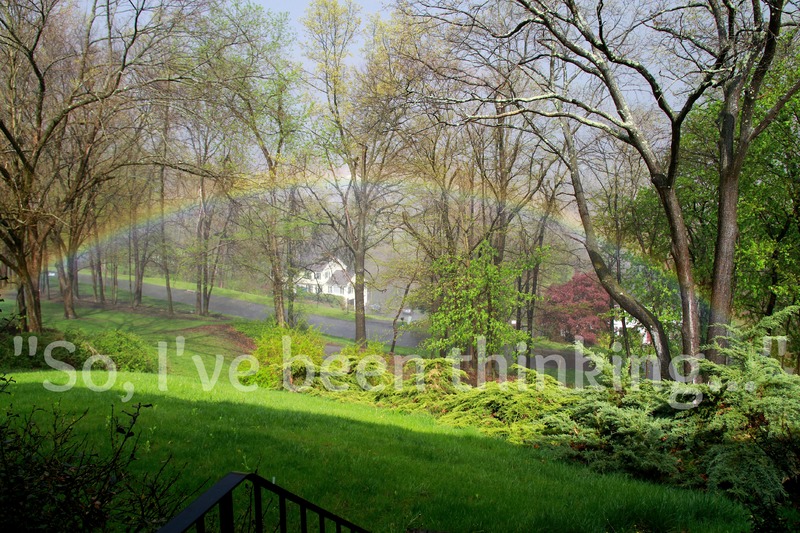 Wordless Wednesday - "So, I've been thinking..."
Rainbow in our front yard. Pot of gold in our neighbor’s. Click one. Click two. You know you want to! Thanks Janine! I couldn’t believe it when I stepped outside and saw it. It was. Unfortunately it lasted about 4 minutes. Thank you Tara. It was pretty cool to see, for sure. That is a gorgeous picture, Steph!! Thank you Rabia! I was crossing my fingers one of them turned out okay. I love rainbows, we dont get them much here, no rain. Thank you Karren, I’ll be catching up with you too! How GORGEOUS! I could have spent a long time enjoying that rainbow! Thanks! It only lasted about 4 minutes, such a crazy experience. That is so pretty, Steph! Great picture! I think I can almost see the leprechauns and fairies peaking out! It looks so magical! Right? I didn’t want to adjust anything on it for fear of anyone thinking it wasn’t real. That almost looks too good to be true! My 5-year-old recently got mad at me because I kept driving to pick up his older brother from lacrosse practice instead of driving towards the end of a rainbow so we could get the gold. Our priorities are clearly different. Thanks funny Jennifer. You can let him know we checked, there’s definitely no gold to be gotten! Oh, so beautiful! It looks like a commercial for Lucky Charms or something. But BETTER! Thanks Ashley! I’m trying to see what I can do with it. So completely beautiful!! I am glad you were able to capture that because WOW! All content and photos are property of "So, I've been thinking..." and may not be copied, reproduced or distributed without express written consent.